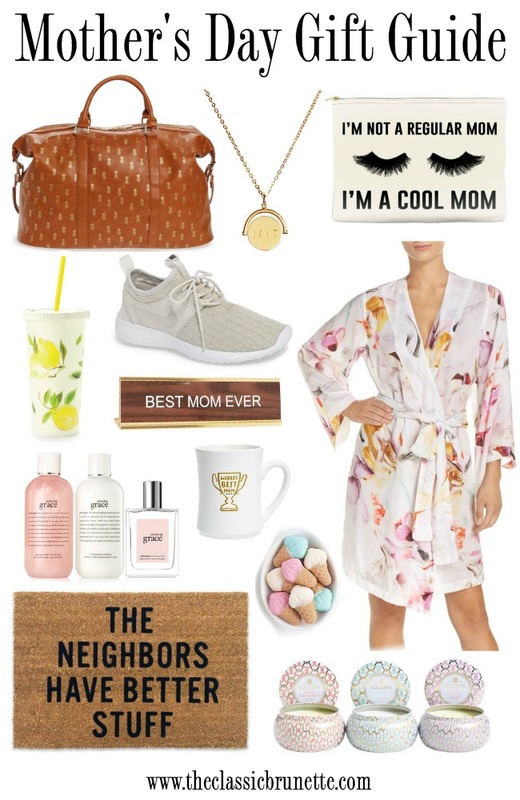 I wanted to make sure that everyone could get their mother something perfect, so all these gifts are under $100, with most being WAY under that! The cute lemon tumbler is the cheapest thing in the bunch coming in at just over $12! Such a steal! I also love the idea of giving a gift set because it's a little more bang for your buck and your mom gets a little something extra than just one item. And who doesn't love multiple gifts? Also I couldn't resist putting that 'Best Mom Ever' desk sign, because it just so happens that I have one that says 'Ask Me About My Cats'. Obviously I'm a crazy cat lady, no surprise there. But when I saw it came in a more Mother's Day friendly option I went for it! I think it's also awesome to get mom something a little more on the practical side for Mothers Day. But I hate when practical leads to boring gifts that aren't really special for mom. Yes it's great when she asks for something she needs, like a new coffee maker for the house, but I like gifts to be a little more personal. I added some Nike sneakers to the list, because who isn't always wearing down their tennis shoes? And also a funny doormat that shows off some personality! Practical doesn't have to mean boring!! What are you getting your mom for Mothers Day? So many good picks! I am loving that robe! I love these picks! I think my mom would laugh at that rug! So many great and affordable gifts. That door mat is hilarious! I think I'm gonna get most of this stuff for me. That doormat hahahaha! I'm with cupkate, I want most of these for me! Shopping for moms is so much fun. I think I'm getting my mom a mani pedi date this year but these gifts are totally cute! these are all such awesome ideas! This is such a great gift guide. Love everything! It's all so cute! I need to get something for my mom ASAP. Such a great round up! I love that pineapple duffle!! Haha, I love that cheeky doormat - too cute! I might have to buy that robe for myself!! what a great gift guide! I want all of this! Such a great gift guide! I'll definitely be using it! This is such a cute gift guide!!!! That makeup bag is too cute! I love these gift options! ok, my mom really doesn't like "things" but I think she would love that desk nameplate for her office! All of these picks are SO cute! I think the make up bag is my favorite... or maybe the door mat? They are all so cute! Omg I adore all these Mother's day gift ideas. My mom would just love that floral robe its so her! I love all of your picks, especially that pretty robe! I think I need that for myself! This is all so pretty, that great gift ideas! That bag is to die for!! In love! Great ideas! I want some of these for myself, lol!